The challenge to achieve quiet hands when riding is an obstacle every rider has to address. All observers love watching an elegant and effective rider, one whose body smoothly absorbs the movement of the horse and appears to be one entity with the horse. It’s a goal all riders want to achieve with every ride, on every horse. To achieve this takes practice; it is a process that must be worked on. Working on the longe line is a very effective method as it lets the rider focus on their body and learn to train their hands to remain quiet while the allowing the rest of the body to learn it’s part of following the horse’s movement. 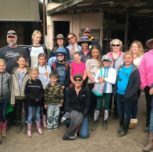 In my book, Enlightened Riding, I devoted a whole chapter to specifics of this process, however I’ll pinpoint a few in this article. To achieve quiet hands, the rider’s position must be correctly placed, which means in correct alignment as if the rider is standing on the ground but with knees bent and legs apart (which would be around the horse’s body). There should be an imaginary plumb line from the rider’s ears, through the shoulders, hip and heel (which should be slightly lower than the toe). There is a second imaginary line from the elbow through the hand, to the bit when the horse’s head is in the correct, rounded neck position (as it is when on the bit). The rider’s weight should be evenly distributed between the two seat bones and the fork (under the rider’s pubic bone). To develop control over the hands, longing the rider can be beneficial. In a longing session, it is essential to use a calm, steady horse and have the assistance of a knowledgeable handler. Correct tack is also very important and it is helpful to use an enclosed circular area of about 15 meters, so there is less distraction for the horse. Be sure the horse is relaxed before beginning so there is more chance of focused work for both the horse and rider. It is also helpful to have a small pommel ‘grab strap’ on the saddle to help steady the hands. 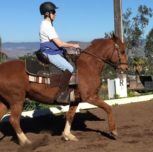 Following the horse’s movement in walk, trot, and canter is essential in learning to keep the hands still. In the walk, the hands must follow opposite the hips so as the hips go backward, the hands follow the horse’s head forward and vice versa. In the trot, the hands remain quiet in sitting trot. In the posting trot the elbow must open slightly, (staying close to the body) in the up phase and close slightly in the sit phase to prevent the hands from bumping the bit in the horse’s mouth with each post. In the canter, the hands must go front and back horizontally in unison with the rider’s hips, in this way allowing the canter to move fluidly through the horse’s body without restriction. As the rider begins the longing session, attention to the rider’s correct following must be the focus. It is probably easiest to begin in the walk, as there is less concussion. Let the hands follow the rhythm and let the handler observe the rider, noting if their hands are smooth or not. It is helpful to look down while learning to see what it looks like to follow correctly and quietly. Then when trotting, take hold of the ‘grab strap’ with two fingers of one hand (probably the inside hand), so the outside hand and inside leg can help keep the horse out on the circle (the handler can help support the function of the inside rein). The ‘grab strap’ will help stabilize the one hand, and the other hand can be kept close to the quiet one. This also helps the rider learn how to open and close the elbows in the posting trot. In the canter, the same pattern will help stabilize the inside hand, and the outside hand can learn to stay close to the inside quiet hand. Be sure to remember the elbow will straighten a little on the third beat of the canter, when the horse’s neck and rider’s hips reach forward in the stride. This will help prevent the horse getting too deep and taking away from the quality and reach of the canter stride. Practicing this process will train the hands to stay quiet while still following the horse’s movement correctly. The same method of grabbing onto the ‘grab strap’ can be followed even when off the longe line as can the habit of glancing down at the hands or glancing at a mirror while riding. It takes a lot of repetition but the rewards of attaining your goal is a gift you give to your horse while also being very proud of the picture you present when you ride! 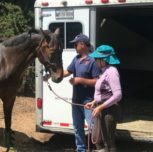 Barbi is an active dressage trainer, competitor, and USEF “S Judge”. 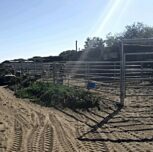 She and her husband own Sea Horse Ranch, a boarding and training facility on the central California coast. She has won many regional and national championships and currently competes on her three Dutch horses: Vindicator at Grand Prix, Dante Heir at fourth level, and HappyM at first level. Over her career she has brought 8 horses up to the Grand Prix level.